Doubling in size, today Primavera Sound has announced its huge electronic music program, including a total of 62 performances set to fill the two stages of Primavera Bits, one dedicated to live format and the other to DJ sessions. Having always been committed to electronic music through its ever diverse line-up, the festival returns this year for its 17th edition on May 31 through to June 4th with an incredible array of DJ acts set to head up its electronic bill. 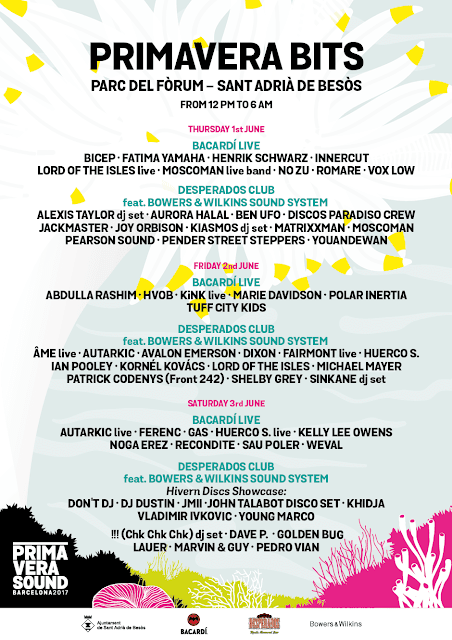 The already impressive line-up continues to grow with additions by Hot Chip vocalist Alexis Taylor, Jackmaster, Ben UFO, Pearson Sound, Bicep and Joy Orbison to name but a few. Complimenting this is a whole new area to the site with the added Desperados Club creating a unique atmosphere to enjoy with the inclusion of the now classic Bowers & Wilkins Sound System.